Senator Elizabeth Warren, who falsely claimed to be Native American last October, has officially entered the 2020 race for President. In an 8:30 a.m. email on New Year’s Eve, the Massachusetts Democrat announced she was forming an exploratory committee to raise money and fill staff positions before a formal launch of her presidential bid. Nytimes.com reports: Ms. Warren also released a video that leaned on the anti-Wall Street themes, a campaign message that drew strong praise Monday morning from liberal groups. Ms. Warren, 69, is among the best-known Democrats seeking to take on Mr. Trump, who has already announced his re-election campaign, but she also faces challenges: recent controversy over her claims to Native American heritage, skepticism from the party establishment and a lack of experience in a presidential race. More than three dozen Democratic senators, governors, mayors and business leaders are also weighing bids — most of whom have not sought the White House before. The race is expected to draw several women and nonwhite contenders as well as liberal and more moderate politicians — making for the most diverse field in history. Several Senate colleagues of Ms. Warren are likely to enter the race soon: Kamala Harris of California, Cory Booker of New Jersey and Kirsten Gillibrand of New York. Ms. Warren’s announcement drew immediate praise from liberals, who have long hoped that the vocal Trump critic would run for president. 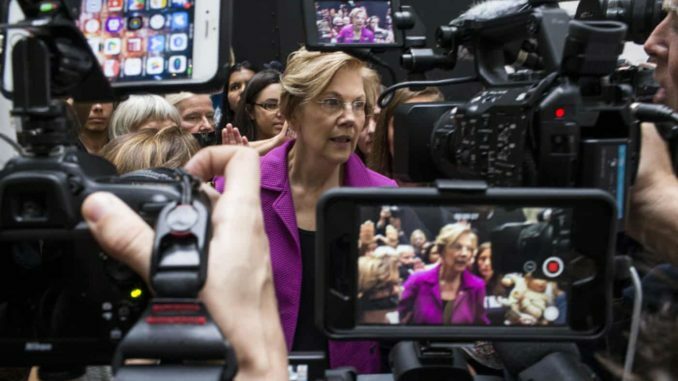 Among grass-roots activists eager to highlight their message of a rigged economic system, there was particular excitement that Ms. Warren’s announcement video focused on issues like income inequality and corporate greed. The Progressive Change Campaign Committee said “Elizabeth Warren meets the moment” and Waleed Shahid, a spokesman for the leftist group, Justice Democrats, said Ms. Warren’s “message of multiracial populism is exactly the right way to take on Trump’s divide and conquer agenda,” though lacking policy specifics. “Now that she is formally running Americans will see her for what she is: another extreme far-left obstructionist and a total fraud,” Ms. McDaniel said. But Ms. Warren has also become a favorite target of conservatives, who have sought to brand her as an out-of-touch liberal from academia. In 2012, the political director for the U.S. Chamber of Commerce said Ms. Warren represented a “threat to free enterprise” and, this year, two Democratic senators — facing difficult re-election races in states Mr. Trump won in 2016 — took the unusual step of distancing themselves from Ms. Warren, their own colleague. There is also the issue of her decades-old claim of Native American ancestry. Mr. Trump regularly slurs Ms. Warren as “Pocahontas,” a reliable applause line at his rallies. In October, Ms. Warren released results of a DNA test showing strong evidence that she has Native American pedigree dating “6-10 generations ago.” Not only did the test not quiet her critics, it puzzled many Democrats and angered leaders of several Native American tribes who said Ms. Warren’s actions contributed to a harmful narrative that blood, not cultural kinship, determines tribal affiliation. The blowback over the DNA test has caused some longtime supporters to question Ms. Warren’s political acumen, since any Democratic nominee seeking to oppose Mr. Trump would have to deftly navigate his constant barbs and often inflammatory rhetoric. But Ms. Dvorsky also said Ms. Warren’s announcement video — particularly her focus on “how the middle class is being destroyed” — would resonate in Iowa, as long as Ms. Warren sticks closely to that message rather than trading taunts with the president. A Quinnipiac University poll in mid-December underscored Ms. Warren’s strengths as a primary candidate, finding her better-known and better-liked by Democrats than any other candidate who had not run for president before. Three in five Democrats had a favorable opinion of her, compared with just 12 percent who viewed her unfavorably, a ratio outdone only by Mr. Biden and Mr. Sanders. To the extent that Democratic primary voters are inclined to cast their ballots tactically — in favor of a candidate who appears likeliest to beat Mr. Trump in the general election — Ms. Warren may have some serious convincing to do. Ms. Warren is regarded with anxiety or worse by much of the Democratic political establishment, including some Senate colleagues who complain that she has pursued an inflexible agenda on matters like bank regulation, at the cost of party unity. During her Senate years, Ms. Warren has demonstrated the most influence as a member of the Banking Committee, aggressively questioning leaders of the financial industry about excesses and abuses; seeking accountability for the Great Recession; and challenging the Obama and Trump administrations to take tougher lines on regulations and trade policy. In 2015, Ms. Warren sunk the nomination of Antonio Weiss, the Wall Street banker selected by the Obama administration to serve as third-ranking official at the Treasury Department, taking on her party on the grounds that Mr. Weiss, the former head of investment banking for Lazard, was too closely connected to the financial services industry to serve in public office. The map of states with early nominating contests appears, at least on the surface, to be an inviting one for Ms. Warren: The race begins in Iowa, where Farm Belt populism long defined Democratic politics, before moving to her political backyard of New Hampshire. During the midterm elections, she got a rousing reception in Nevada, an early state that suffered grievously in the 2008 financial crisis, and where rhetoric lashing Wall Street and major mortgage lenders tends to resonate. Ms. Warren’s prospects may also depend, in part, on which other Democrats decide to run. Several other fiery economic populists could join the Democratic field, including Mr. Sanders and Senators Sherrod Brown of Ohio and Jeff Merkley of Oregon, potentially splintering the voters most energized by Ms. Warren’s core themes. And like other white liberals in a historically diverse field, Ms. Warren may have to work harder to win over black primary voters in South Carolina, another early voting state, and across the country. African-American Democrats have played a decisive role in settling the last two open contests for the Democratic presidential nomination, and Ms. Warren is expected to be competing against her party’s only two black senators, Ms. Harris and Mr. Booker. In Ms. Warren’s video announcing her candidacy, she pointed to the unique discrimination that nonwhite families face — another sign of how seriously she is taking outreach to minority voters, and particularly black Democrats. Whatever obstacles her candidacy faces, Ms. Warren may be well positioned to serve as an ideological pole star in a diffuse field of Democratic candidates. And she has a history of surprising skeptics who might have been inclined to view her as a wild-eyed caricature. One of her potential foes for the Democratic nomination, Michael R. Bloomberg, the billionaire former New York City mayor, confided to associates after a chance meeting with Ms. Warren that he found her impressive and smart despite their drastically different views of the economy.